“Two steps forward, one step back – and another two steps forward” has always been how our movement has achieved transformative success, over decades of tenacious advocacy and activism. 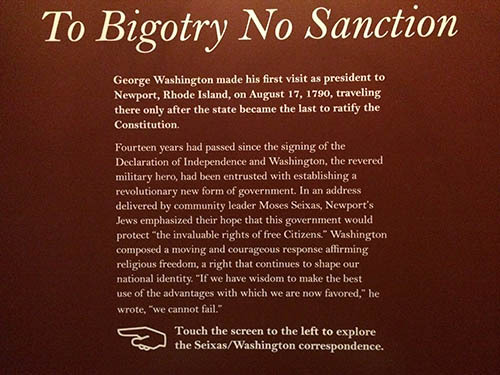 Last Monday, I found myself at the National Museum of American Jewish History in Philadelphia, on the same day as the start of the Democratic Convention. 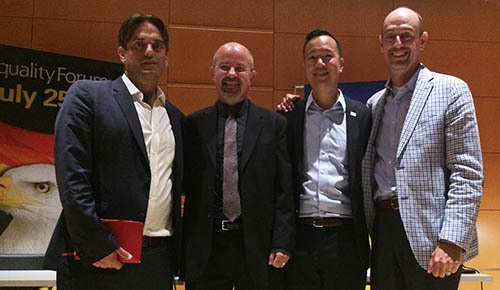 I was there to speak on a panel about the national LGBTQ movement, organized by the Equality Forum. Washington later borrowed this phrase in his subsequent letter to the congregation. It was the first time in modern history that the leader of a nation had guaranteed the right of Jews to participate fully in their government, free of bigotry and persecution. And while that ideal was stained by the Constitution’s acceptance of slavery and the disenfranchisement of women, the promise of inclusion for those who are most persecuted in our society was a radically progressive foundation on which to build our democracy. This idea was on my mind during the Equality Forum panel. While I couldn’t make political endorsements as the head of a 501(c)(3) tax-exempt non-profit organization, I could comment on the LGBTQ policy issues being debated, and endorsed, by our elected officials. I observed that the Democratic platform is the most LGBTQ-affirming platform ever adopted by any major political party addressing as it does racial and LGBTQ disparities in school discipline, keeping vulnerable LGBTQ immigrants out of detention facilities, and ending the “crisis of violence against transgender Americans.” The DNC also featured the first out transgender speaker at a major party convention. Not only that, but I was stunned and pleased during my train ride down from Boston to see a photo tweeted of gender-neutral bathroom signs posted in the convention hall. What our political leaders say and do sets the stage for our national conversation about the full inclusion and affirmation of LGBTQ people. That theme resonated throughout our panel, which also included Williams Institute Executive Director Brad Sears, the ACLU’s James Esseks, and Shannon Minter from National Center for Lesbian Rights. We discussed the over 200 anti-LGBTQ bills introduced across the country, targeting trans people in public spaces and restrooms, and granting individuals the right to discriminate based upon personal religious beliefs – often with the full-throated support of anti-LGBTQ elected representatives. Our rights have become political red meat for our opponents. And that political vitriol and animus is trickling down to the rest of society, creating one of the most hostile climates for LGBTQ people, especially transgender women of color, in recent memory. Yet, despite the fearmongering of the countermovement, our own movement has been remarkably effective at thwarting these attempts at cutting away our rights. Of those 200 bills barely a handful have passed. And those that have passed have met widespread condemnation, illustrated most recently by the NBA’s recent decision to pull its All-Star game from North Carolina. We continue to win groundbreaking cases, such as GLAD’s recent victory against a Catholic high school that fired a food service director because he was married to a man. And we are still winning in state legislatures to expand anti-discrimination protections, such as the recent passage of public accommodation protections for transgender people in Massachusetts. What we need today are political leaders, from all parties and at all levels of government, to stand by that same principle that is the at the heart of our nation’s promise – a promise that has always been a work in progress, and that we must continually strive to fulfill.